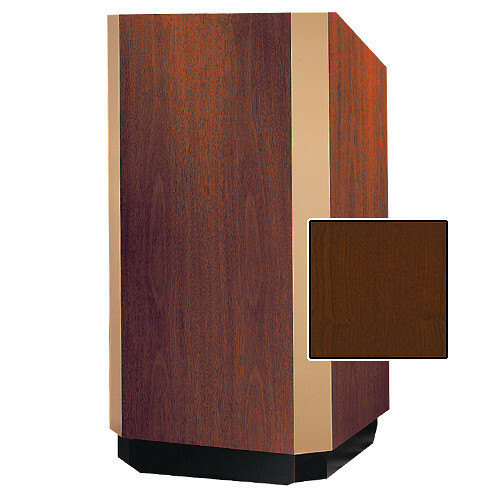 The Da-Lite Yorkshire Adjustable Floor Lectern with Premium Sound System is a 48 x 32 x 22" (H x W x D) floor lectern that comes with a premium sound system that provides 100W of RMS power. It has a high-intensity reading light and LED digital clock/timer with countdown capability. It has an over-size reading surface that holds a three-ring binder and heavy duty industrial casters for easy mobility, as well as a spacious storage shelf. The height can be adjusted from 47 to 55" by using the electric height adjustment.